Girard High School "Big Red"
Girard (population 2,245) is located in the lower portion of central Illinois in the northeast part of Macoupin County. Girard is situated approximately 20 miles south of Springfield on Illinois Route 4. County Road 12 also leads you to and from Girard. According to www.mapquest.com the Burlington Northern & Santa Fe as well as the Southern Pacific Railroad lines both travel through Girard. The Chicago & Northwestern Railroad line passes by the west side of Girard. The area in which Girard is currently located was first occuppied by the Pottawanomie Indians. In the early 1800s, probably the late 1820s, a gentleman by the last name of Girard moved into the territory. He soon built a sawmill and several people moved to the area. In 1834 the village was platted and registered as Girard. The same booklet offers a chapter on the history of the Girard school system. That article, in summary, states that it was in the mid-1850s that the Girard school system was officially established. The first school house, a wooden building, burned down in 1870. A new building was erected soon and a grade school was established. In 1892 the school system added two years of high school study. A third year of high school was added in 1897. The fourth year of high school classes was added in 1904. The school was recognized as a township high school in 1914. 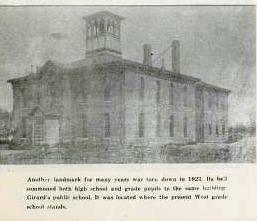 A new building for the Girard school system was erected in 1919. The Girard school system was strong through the early 2000s. It was in the 2006-09 years that consolidation talks became serious between the school districts of GIrard and its nearby neighbor to the north, Virden. Voters decided the timing was right for this effort to take place. The 2009-10 school year was the final solo year for both Girard High School and Virden High School. The two districts consolidated and now combine to make up what is known as the North Mac School District in honor of the county in which it is located. The high school will be located in Virden while Girard will continue to host a grade school. The Girard High School "Big Red" athletic program had some incredibly successful seasons. Below are listed the seasons for each sport recorded on the IHSA website (www.ihsa.org). Included in the Big Red success stories is a STATE CHAMPIONSHIP!! The boys track team of 1923-24 won the IHSA Class'B' State Title over some very tough competition. There were also some District, Regional, and Elite 8 teams as well as some Gold Medal individual stars. If you any further information regarding the Big Red athletic program please contact us at ihsgdwebsite@comcast.net. A Regional Championship in 1990-91 highlighted the baseball program's successes. The team's record and coach's name for this season are needed. Several other season records are also missing. Please contact us if you have this information to share. Only two seasons of girls softball are listed on the IHSA website. We know there are many more seasons to record. Below are the two seasons which we were able to locate. Two District Championships and four Regional Titles put a great finish to the excellent basketball program enjoyed by Big Red fans over the years. One of the school's best seasons came as recently as 2008 with the boys winning a Regional championship with a 27 - 6 record. Several coaches names are missing. Please contact us if you can add to the list below. The lady's Big Red basketball program won a Regional title of their own. The team record and coach's name of this team are needed. In fact, there are several seasons in which the record and coaches names are missing. Below are those seasons listed on the IHSA website. The Big Red football program played in the heart of Illinois high school football country. Girard High School fans had some very exciting seasons to cheer about. Two undefeated regular seasons and two Elite 8 appearances made for some great football memories. The Girard High School Big Red made a total of 10 appearances in the IHSA State Playoffs. If you have information on more of the football program's success please contact us at eganann@sbcglobal.net . **During the 2nd round loss to Mt. Olive, Girard's Don Pragrais tied the record for the longest kickoff return for a touchdown in a Class 1A playoff game going 93 yards on November 03, 1990!! **The defense of the Big Red of 1991 is in the IHSA record books by tying for 3rd place ALL-TIME with 9 shutouts!! **In a regular season game versus Auburn the Big Red forced Auburn's Chris Crowe to punt 10 times, tied for second place in one game ALL-TIME in IHSA history!! The IHSA Class 'B' Meet STATE CHAMPIONSHIP highlighted the many successes of the Big Red thinclads. Several individual state champs and even more top 8 medalists made for a very impressive resume' for the Girard High School Big Red track program. Hal Routzahn Pole Vault 4TH Place! Ollin Driver 220 Yd. Dash 2ND Place! Willard Whitler Shot Put 2ND Place! Sterling Littlepage Pole Vault 4TH Place! Theodore Whitler Javelin STATE CHAMPION!!
? Anspaugh Pole Vault 2ND Place! Harold Chere Long Jump 2ND Place! Howard Green 1 Mile Run 2ND Place! Clyde England Long Jump 3RD Place! Paul Lair Javelin 4TH Place! George Nevius Pole Vault STATE CHAMPION!! Cliff Williams 440 Yd. Dash 3RD Place! Bill Nichelson 120 Yd. Hurdles 5TH Place! 1956-57 Team Finished 10TH in IHSA Meet!! Bill Nichelson 120 Yd. Hurdles 2ND Place! 180 Yd. Hurdles 4TH Place! Rich Roper 400 Meter Dash STATE CHAMPION!! RELAY TEAM 4x400 M Relay 7TH Place! Bill Nichelson 800 Meter Run 6TH Place! Mike Maddox Discus 4TH Place! Liam Cormier Shot Put 2ND Place! Mike Maddox Discus 2ND Place! Mike Maddox Discus STATE CHAMPION!! Matt Maddox Discus 4TH Place! Matt Maddox Discus STATE CHAMPION!! Two lady Big Red tracksters brought home individual medals from the IHSA State Track Meet. This came during back to back seasons in the late 1990s. Beth Louderman Discus 4TH Place! Stephanie Mullen 3200 M. Run 3RD Place! The lady netters won two Regional Championships. Only four seasons are listed on the IHSA website. Most impressive is the fact that the Lady Big Red netters won their two championships right at the end of the program's existence. Our guess is there were many more successful years for the Big Red volleyball program. One lady linkster won back-to-back trips to the IHSA State Meet finals. This was also done during the time when the IHSA only offered one class for the girls to compete in. Myona Weller's two medal winning performances are listed below. The boys held their own on the 18 hole courses too. Two team District titles and an individual medalist were the pinnacle of the success enjoyed by the linksters. Below are the years these accomplishments were attained. The girls athletic program offered soccer as well. Only five seasons were listed on the IHSA website. If you have information on more, please contact us via the means listed below.